I was working the other weekend (well, more like swanning around taking photographs whilst my friend did all the work selling on her stall) and unfortunately noticed how many people had coughs, colds and sneezes around me. A couple of days later I woke up with a strange feeling in the top of my mouth, a tickle in my throat and just a ‘weird’ feeling in my head. Determined not to succumb to an autumn cold, I quickly made a mug of this spicy golden turmeric milk for myself and my husband (who had just joined me for a few days holiday). 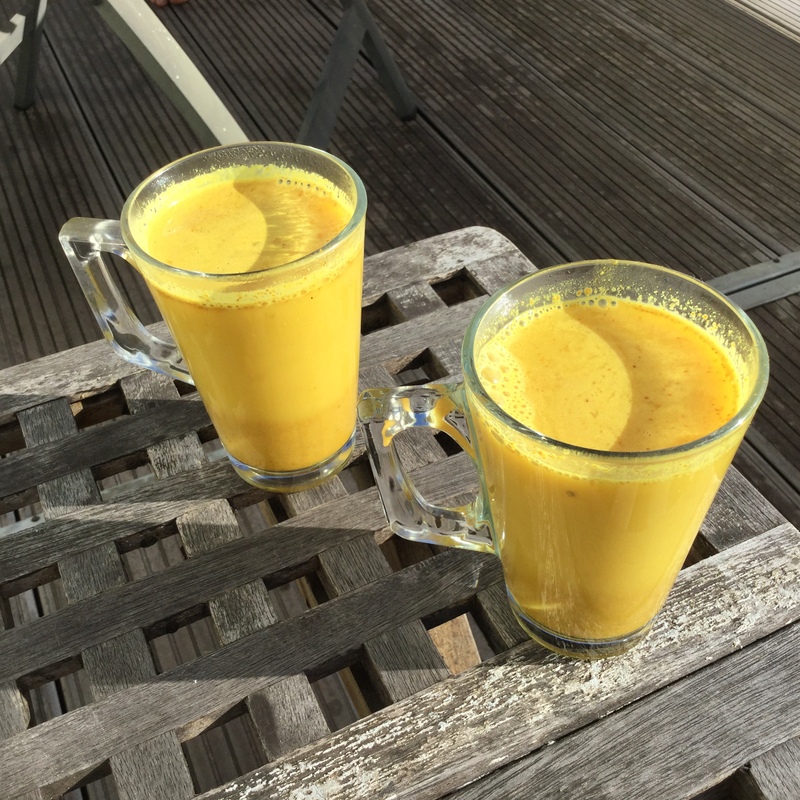 There is an extremely good blog about the benefits of turmeric here from Kellie at Food to Glow describing it much better than I can. All I know is that after a few days of having a delicious mug of golden milk, my symptoms totally disappeared and didn’t develop into a cold (or worse). As Kellie recommends, this is a really tasty alternative to a morning coffee especially now that the autumn and winter season is creeping nearer and with it, the seasonal colds and flu that abound. Gently heat all ingredients in a saucepan, whisking together. Bring to just under a boil and enjoy whilst warm. As the ingredients are not soluble, keep a spoon handy and stir your cup of milk otherwise the contents will settle. For anyone suffering from a cold or flu I can heartily recommend this Juice Shot. It’s another drink I have if any unpleasant symptoms threaten and I am sure it shocks the cold away as it has been a long while since I succumbed. Last winter my husband went down with a dreadful cold and I gave him a ‘shot’ three times a day and after every shot, he felt vastly improved and he reckons it helped alleviate the horrible symptoms. This entry was posted in Miscellany and tagged cardamom, coconut milk, colds, drink, Gluten Free, golden milk, Healthy Eating, honey, Turmeric. Bookmark the permalink.